Discover the technologies set to revolutionize how you live. 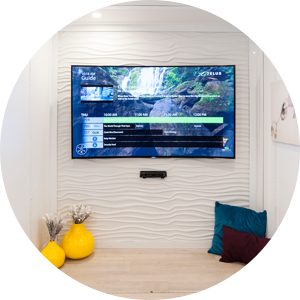 TELUS Future Home is a dynamic and interactive travelling smart home demonstrating how friendly the future can be. Experience firsthand how connected technology can transform daily living. Where you can interact with appliances. Manage your living environment. Centralize your communications. And surround yourself with entertainment.The touchpoints help you simplify everyday activities, keep you safe, stay healthy, more informed and more comfortable. With technology powered and made possible by the lightning-fast TELUS PureFibre™ network, a home like this helps you live smart. Imagine facial recognition technology at the front door turning lost keys into a thing of the past. A kitchen counter to count calories and display recipes. Sensors to tell you when it’s time to water your plants. 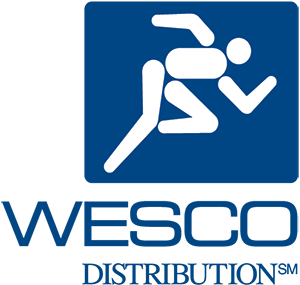 And enough bandwidth to stream, surf, download and monitor at ultra-high speeds from your family's multiple devices. 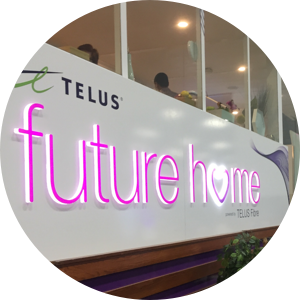 TELUS Future Home is living proof it’s all possible. See for yourself. Start your journey with the amazing face-scanning front door and explore the rest of the Future Home's interactive elements. 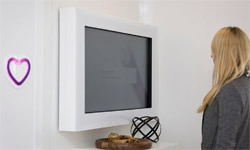 Facial recognition technology greets guest and opens front door – hands free. Foyer screen introduces guests to the Future Home Hub which provides status on the home including temperature, energy consumption, missed deliveries and notifying family members you’ve arrived home safely. A fridge that helps plan meals, track inventory and add items to a shopping list. Scanner that provides nutritional information on foods. The office provides the ability to video conference into meetings, listen and view a visual voicemail from a family member, upload daily health related info and view a reminder for an upcoming doctors appointment. 78” curved 4K television showcasing the best in entertainment. Exit screen provides calendar updates and locks your door upon exiting the home. © 2019 TELUS Communications Inc.